There is a tension in the household. She Who Must Be Obeyed likes boneless skinless chicken breasts because the are leaner and she likes white meat. I find they have little flavour and tend to become dry and rubbery when cooked. Apparently I am wrong and I was instructed to make some for dinner. 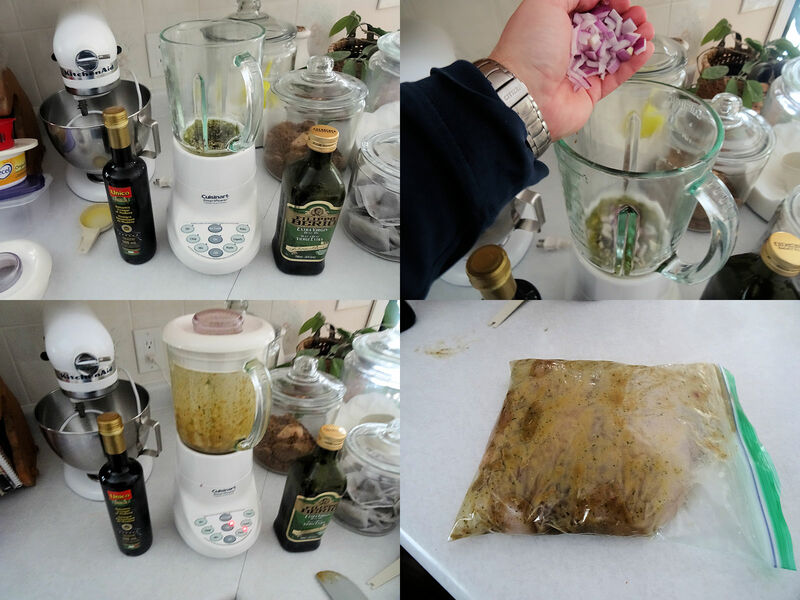 In order to make something I could enjoy too, I decided to marinate the chicken for moisture and flavour. I processed it until it was smooth. I put two boneless skinless chicken breast halves in a plastic bag and added the marinade mixture from the blender. I put it in the fridge for 3 hours, massaging the bag occasionally. 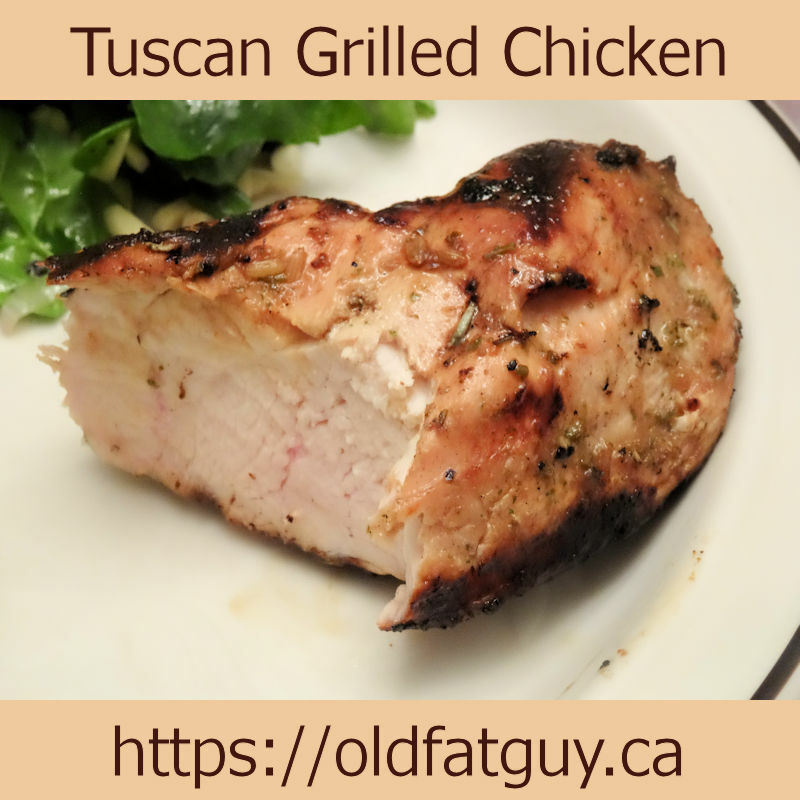 I preheated my gas barbecue to medium and cooked the chicken breast for about 16 minutes, turning and brushing occasionally with 25 ml (2 tbsp) lemon juice. 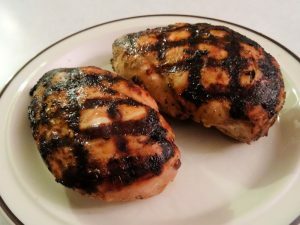 Make sure the internal temperature is over 165 F.
The marinade gave some nice herb flavours to the chicken and helped give great grill marks. The lemon brushed over it gives just a hint of lemon tang without being overpowering. The chicken was still moist. I enjoyed this and She Who Must Be Obeyed really likes it. Although I would have preferred thighs or a breast with the skin and bones, I have to admit this was good. Don’t tell She Who Must Be Obeyed. Put all ingredients except the chicken and lemon juice in a blender or food processor. Process until smooth. Put the chicken in a plastic bag and add the marinade. Put in the refrigerator for 3 hours, massaging occasionally. Preheat a barbecue grill to medium. Discard the marinade and cook the chicken for about 16 minutes to an internal temperature of over 165 F, turning and brushing occasionally with the lemon juice. Awesome Dave, it looks so good. We were going to have breast of chicken !